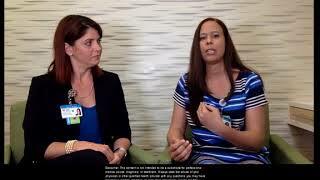 The program at the Nicklaus Children's Dan Marino Outpatient Center is internationally recognized and offers a comprehensive care program for autism and other developmental/cognitive disorders in children referred from all over the world. The Center also coordinates community outreach projects that include the services of specialized medical and allied healthcare professionals, educational organizations, volunteer programs and parent support organizations. Autism impacts the normal development of the brain in the areas of social interaction, communication skills, and cognitive function. Individuals with autism typically have difficulties in verbal and non-verbal communication, social interactions, and leisure or play activities. Males are four times more likely to have an ASD than females. Autism greatly varies from person to person (no two people with autism are alike) and ranges from very mild to severe. Attention deficit disorder with or without hyperactivity (ADHD) is the most common behavioral disorder of childhood, affecting 3 to 7 percent of school-age children. The three main ADHD symptoms in children include inattention, hyperactivity and a tendency to be impulsive. These traits can lead to difficulties in school, poor interactions with other children and adults, and low self-esteem. Associated disorders can include anxiety, depression, difficult behavior (oppositional defiant disorder), tics and learning disabilities. The first step for parents seeking care and assistance for their children is a full evaluation by a physician – either a pediatric neurologist or psychiatrist specializing in ADHD. The physician will obtain a detailed medical history and perform a thorough physical and neurological examination. A consultation with a psychologist specializing in ADHD is usually recommended. This may include an IQ test and evaluation for symptoms of ADHD and other conditions that can be associated or mistaken for ADHD. Once the evaluation is complete, the physician will meet with the family to discuss and explain results. If your child exhibits several of these symptoms, he or she may be a candidate for evaluation by a team of professionals. Expand each section for more information.